For audiophiles who demand the very best in vacuum tube pre-amplification, Rogue Audio provides it with the Rogue Sixty-six With astonishing accuracy, the Sixty-six reference preamplifier reveals all of the nuance and detail previously hidden in your recordings. A deep taut bass is recreated with surgical precision, while sparkling and airy highs seem to transcend earthly bounds. A sublimely smooth yet uncolored midrange provides the basis for musical experiences you will wish never to end. Equally impressive are the rock solid imaging and deep soundstage that provide unparalleled musical presence. 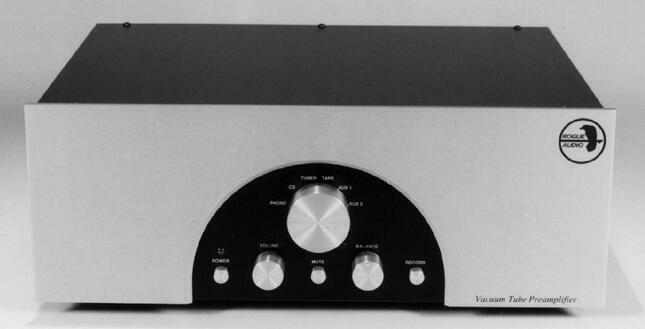 The Rogue Sixty-six is a full feature preamplifier that includes a high gain phono stage, active-load line stage, and separate power supply. Other not-so-obvious features include an auto-mute function to limit dangerous transients at turn-on, a slow start feature to prolong tube life, and a record button to isolate sonically degenerative tape equipment when not recording. In keeping with Rogue Audio's "quality by design" philosophy, only the finest components are included in the Rogue Sixty-six Gold and silver abound as do ultrahigh tolerance resistors, polypropylene capacitors, ceramic tube sockets, and all of the other exotic componentry so important to discerning audiophiles. And to complete the picture, all of these technical features are captured in a sophisticated chassis design which artfully displays the exacting electronics held within.